Media and Press Information for Dr. Karyl McBride's Published Books. For media requests please contact Dr. McBride at (303) 420-9565 or send Dr. Karyl McBride a message. From birth through adulthood, the mother-daughter relationship affects the daughter’s emotional development, with the mother serving as her daughter’s primary role model for developing as an individual, lover, wife, mother, and friend. Daughters of narcissistic mothers, however, learn at a very young age that their mother’s love is not unconditional, and the fallout from this painful legacy of distorted love is particularly insidious. The American Psychiatric Association estimates that there are 1.5 million American women with Narcissistic Personality Disorder. In a society that is captivated by social networking sites, celebrity culture, and standing out in the crowd, these numbers do not seem so farfetched. In Will I Ever Be Good Enough? Healing the Daughters of Narcissistic Mothers (Free Press; September 8, 2009; $15.00; paperback,) Dr. Karyl McBride – herself a recovering daughter, and a therapist who has devoted almost twenty years to research on narcissistic parents and their effects on children – pulls back the curtain on maternal narcissism, tackling the challenges facing daughters of narcissistic mothers, and claims that this destructive pattern can be overcome. In this pioneering work, Will I Ever Be Good Enough? Dr. McBride lays out the characteristics and dynamics of Narcissistic Personality Disorder, the common symptoms facing daughters of narcissistic mothers, such as over-sensitivity, indecisiveness, self-consciousness, inability to succeed in relationships, lack of self-confidence regardless of their accomplishments, and a general sense of insecurity, and offers tools for readers to use to determine if this disorder indeed affects their families. Dr. McBride then highlights how the dynamics of maternal narcissism directly affects daughters’ lives and ultimately provides an easy-to-understand and effective road map for recovery. "Dr. McBride presents specific steps toward recovery that daughters of any age can use as they grieve for the love and support they didn't receive. [McBride] provides parenting tips as well as advice for maintaining healthy love relationships and friendships. An excellent bibliography rounds out this revealing book, which ends on a hopeful and pragmatic note." 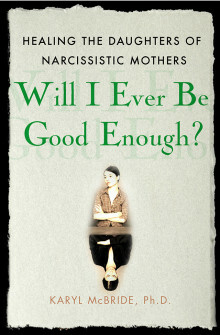 - Publishers Weekly, Starred Review for Will I Ever Be Good Enough? For daughters of narcissistic mothers, the issue is more complex than just “dealing with mom.” Daughters need to know how to read her – when to limit contact and how to set boundaries. These issues not only have ramifications on mother-daughter relationships but can have lasting impact on how these daughters parent their own children. Daughters always fear passing on the distorted legacy of love, and they want to avoid raising a narcissistic child. These fears also filter themselves into other aspects – in their love relationships, career choices, and everyday thoughts and feelings. In Will I Ever Be Good Enough? examples of such instances are highlighted as Dr. McBride recounts her own experiences and tells similarly shocking stories and affecting anecdotes from the hundreds of women she has interviewed and treated over the years. A book that is long overdue,Will I Ever Be Good Enough? gives a voice to the millions of daughters suffering from the abuse of their self-involved, destructive, narcissistic mothers, and provides them with the much-needed tools to overcome the devastating effects of this disorder so they can lead happy, healthy, fulfilled adult lives. Written for daughters who have spent much of their adult lives dealing with the fallout of never having received maternal support and love from a narcissistic mother. - From Will I Ever be Free of You? From leading popular psychologist Dr. Karyl McBride, author of the national bestseller Will I Ever Be Good Enough,Will I Ever be Free of You? 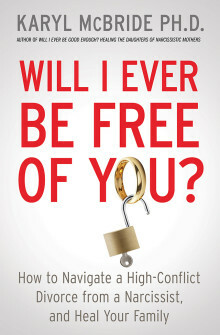 How to Navigate a High-Conflict Divorce from a Narcissist, and Heal Your Family (Atria Books; ISBN: 9781476755694; $25.00; On Sale February 10, 2015) is a revolutionary guide to successfully managing a divorce from a narcissist, and surviving its aftermath. With nearly three decades experience as a therapist to divorcing partners and children of divorce, McBride has created a step-by-step program for healing the precise type of emotional damage that narcissism causes, while offering the tools to protect and nurture family through the divorce and afterward. How does anyone know when he or she is in a relationship with a narcissist? There are conflicting ideas about the classification and prevalence of narcissism in America. While the American Psychiatric Association estimates the disorder manifests in less than 1 percent of the population, researchers state that nearly 1 out of 16 Americans has narcissistic tendencies. Dr. McBride believes the answer lands somewhere in the middle and explains that narcissism is a spectrum disorder, and can range from a few traits to a full case of Narcissistic Personality Disorder.Will I Ever be Free of You? provides checklists of traits and symptoms, allowing readers to gauge precisely where on that spectrum their partner (or ex-partner) lies. Drawing from clinical research, McBride gives readers remedial advice on how to identify their narcissistic partners and break free of them. With real-life stories of men and women who have been in this situation, she helps readers decide when to stay and utilize treatments such as couple’s therapy and when to leave for good. The book also addresses: religious barriers, physically abusive relationships, emotionally abusive partners, and divorce with children. Will I Ever be Free of You? explains that the court system does not recognize the complexities of a narcissistic divorce – most law professionals assume that any high-conflict case is the fault of both parties. McBride informs readers of the challenges they will face and, with compassionate anecdotes, explains how other people handled similar problems. Will I Ever be Free of You? is an interactive guide for men and women, and the professionals that work with them. Offering practical suggestions and a roadmap of trauma recovery for the whole family, McBride helps victims of damaging relationships with narcissistic partners to heal and go on to live successful, happy lives – free from the narcissist. Karyl McBride, Ph.D. is a licensed marriage and family therapist with over thirty years of experience in public and private practice, specializing in treatment of trauma. She is a leading authority on narcissism and a contributing blogger for Psychology Today. “Will I Ever Be Free of You is a rare achievement. It is insightful, thought-provoking, and powerful guide for dealing with divorce and narcissists. A smart book with an optimistic message from an author who knows how to heal.” - Steven Babitsky Esq. SEAK, Inc.